David Loogan needs a shovel, and as he considers the selection at the local garden center, we become aware that the shovel must meet certain requirements. David Loogan has to bury a body, and for that purpose, some types of shovels just won’t do. At this point of the story, you might think David Loogan is a very bad guy who has done a very bad thing. And of course, you would be wrong. David Loogan is a man with a mysterious past. Currently living in Ann Arbor, Michigan, David works as an editor for a mystery magazine titled Grey Streets. Tom Kristoll is his boss, and Laura Kristoll, Tom’s wife, is David’s lover. What we know about David Loogan could fit in a thimble. We know he dislikes parking garages. He is wary about being outside at night. And when Tom Kristoll says he need help to bury a body, David Loogan barely bats an eye. Yet, when a second body turns up, and a third, we see that it is David Loogan, man of mystery, who might actually be able to identify the killer. With the help of the local police, particularly detective Elizabeth Waishkey, David starts to piece together the motives behind the murders. His detective skills earn him Elizabeth Waishkey’s respect, even while they put both of their lives in danger. This is the first book in the David Loogan mystery series. The second book is titled “Very Bad Men,” and the third is “The Last Dead Girl.” I very much enjoyed the fast-paced, witty dialogue of this book, and I appreciated the fact that, by the end of the book, we still have a lot to learn about David Loogan. He is a man who is loyal to his friends, protective of those weaker than himself, and clearly has a strong sense of justice. Yet, he is a man who seems at ease burying a body, and he also seems capable of excessive violence. The disparity in his character makes me eager to learn more about him, to find out how he came to be this way. 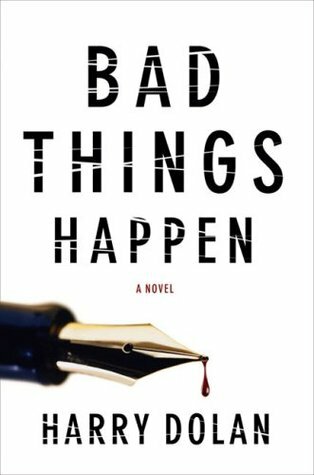 Style-wise, “Bad Things Happen” most reminded me of books from the Spenser series from Robert Parker. I will certainly read the next two books in this series.